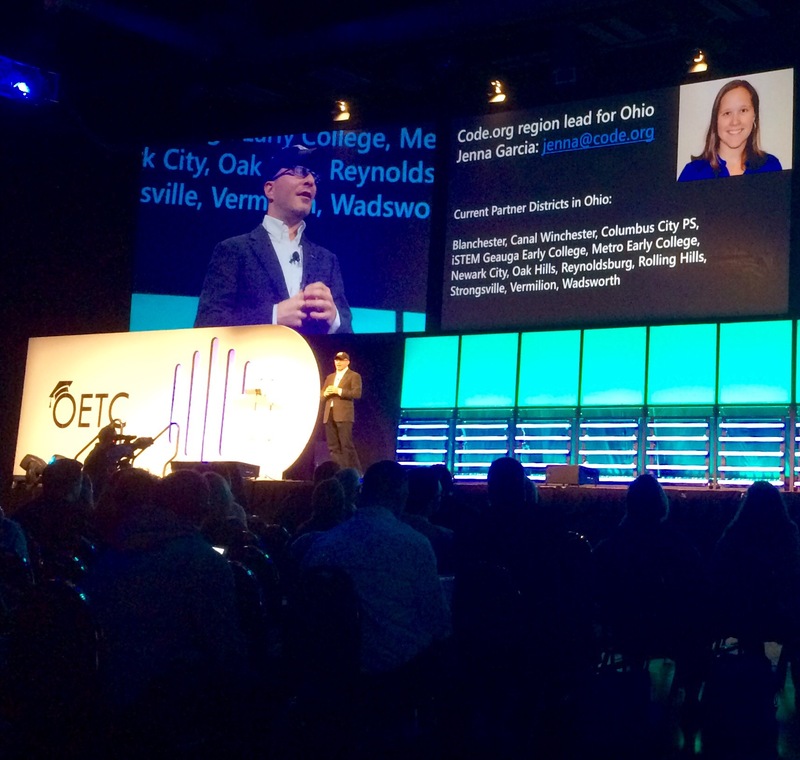 This was my first time attending the Ohio Educational Technology Conference (OETC) and I enjoyed myself and learned a lot. When the conference emcee is a comedian magician, it’s hard not to have a good time. OETC is a conference for P-20 (pre-school through college) educators to learn about and discuss educational technology and innovations. The conference has a wide variety of breakout sessions in addition to the keynotes and a vast vendor floor. Many sessions focused on coding and how to teach it in the classroom, several were about gadgets and gamification, and even LEGOs. Other session covered ideas and advice, such as literacy instruction, digital content resources, grant writing, and classroom planning. Much of the conference seemed tailored to grade and high school teachers. The conference began on Tuesday and went though Thursday afternoon but I was only able to attend on Wednesday and Thursday morning. Mid-morning, I met with librarians and graduate school staff to continue planning for the 2016 United States Electronic Theses and Dissertations Association (USETDA) Conference coming to Columbus in September. Even though it is still months away, a lot of planning has already been done and yet there is so much more to do. In the afternoon, the keynote Hadi Partovi co-founder for Code.org talked about the success of their efforts to get more kids coding. A surprising figure that he presented is that 9/10 parents want their kids to learn computer science but only 25% of all schools teach it. They offer many options and even the ability to make a game on their website and then download it to your phone to play. What a great way to get kids excited about an ever-growing field in our technology-reliant world. I wish I had these great opportunities when I was young; while growing up, I knew very little about it but began truly learning programming in graduate school and really enjoy it…and should devote more time to it. Ohio has its own Code.org contact if you want to plan a Code Hour event or learn about teaching code at your school. Later in the afternoon, I went to the break out session about Open Educational Resources, which was an open discussion about the tools teachers use, how they find them, and what they do when they either go away or are monetized and no longer free. The room was mostly grade school educators and it was interesting to here there take, as I interact with people in higher education. INFOhio lead the session and has lots of resources available for P-12. The entire day, the conference was buzzing with people. In the hallway there were various activities set-up: a MIDI Band from Capital University played and a pop-up makerspace showed off many cool tools and toys, including a BB-8 droid controllable by a smartphone. The morning general session started with a presentation of awards to honor excellent teachers in Ohio, then Dr. Freeman Hrabowski, President of the University of Maryland, Baltimore County, began his keynote address. Unlike other speakers, he did not use slides and actively engaged the audience. He covered current facts and figures about the state of education in America, quizzing attendees who usually overestimated the numbers. One key difference that he had noticed with younger generations is that there is this concept that students are good at this OR that instead of being good at everything; the main key is developmental math and the lack it in skills taught. In other countries, kids are more well-rounded yet that is no longer the case here. For more about his views on education, check out his TED Talk “4 pillars of college success in science”. Later in the morning, I presented at the OH-TECH booth on the vendor floor about the OhioLINK Electronic Theses and Dissertations (ETD) Center and its Google Scholar and ORCID Identifiers integrations. The ETD Center has over 56,000+ open access, freely available original student research. If you aren’t staying in a local hotel, go early, as snow might be an issue since it’s in February, plus it makes it more likely that you can park in the closest ramps. Or take the bus if possible. Since OETC is held at the Columbus Convention Center, consider crossing the street to a local restaurant or the nearby North Market for tasty treats and meals. Plus, 4th street isn’t too far away and there are new additions all the time, like the 16-Bit bar+arcade. Browse the entire program and consider going to at least 1 of the general sessions. There are so many great sessions whether you are looking for a practical tool or advice to put into use right away, or wanting to consider where the future of education and technology is headed. I am already excited for OETC 2017!